Pork tenderloin is a perfect quick weeknight meal because it requires very little prep – simply season it and pop it into the oven! It is a little more expensive but is worth the time savings and ease of cooking. The loin is the most tender cut of meat from the animal and it’s really easy, relaxed and pretty forgiving. If you over cook it slightly, it does not dry out as quickly as a pork chop would and it can also be recovered by adding a gravy or a warm sauce. Pork tenderloin is fairly lean, so, it is much more enjoyable if you do not overcook it to avoid it becoming dry and chewy. Use a meat thermometer (Mine is from Presidents Choice and is very reliable!) insert it into the thickest part of the roast and as soon as the internal temperature registers between 140-145 degrees Fahrenheit, remove the pork from the baking sheet and put onto a cooling rack straight away. A perfectly cooked pork tenderloin will be slightly pink (and opaque like chicken) and will be juicy. Pork tenderloin also makes for great leftovers – I love to add mine to a quick Asian vegetable stir fry and call it another meal! 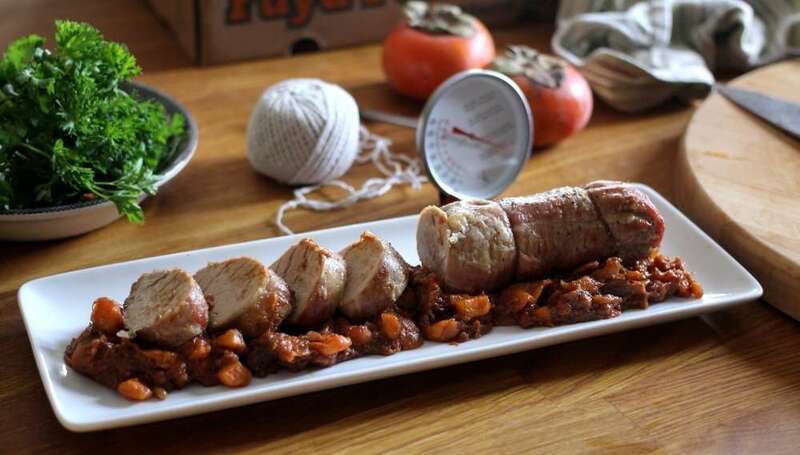 I am using LiberTerre pork tenderloin for this recipe since their pork products are grain-fed and raised without the use of antibiotics or added hormones. I am happy about the generous marbling of the pork as well – a good amount of fat and meat ratio. This is important to ensure the meat stays tender and juicy which makes for an enjoyable eating experience. Most importantly, LiberTerre’s pork products always taste great! You may notice that a cut of pork tenderloin is usually thicker in the middle and thinner at each end. Trussing the pork tenderloin, like I have done, is a little bit of work that goes a long way. Not only does it make for a beautiful presentation, it prevents the thinner tips from cooking before the rest of the tenderloin is cooked allowing the roast to cook more evenly. It also keeps any herbs in place (if you are using any), by allowing you to tuck them into the cotton twine. 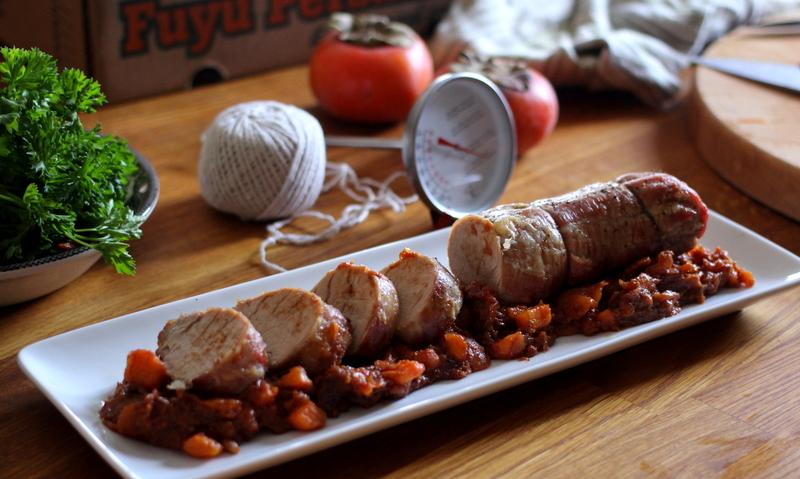 I wanted to use some seasonal produce to pair with the pork tenderloin and I chose persimmons because I have always found them to be very challenging to work with. I always love a great challenge! My intention was originally to make a glaze out of the persimmons but after multiple attempts, I came to the realization that to make a successful glaze, the persimmon would have to be drowned out in multiple ingredients since they, on their own, will not work as a glaze in a roasting situation. A glaze would only work if i were to pan fry the roast. Since I was determined to roast the tenderloin to make for a very easy recipe, I went with my plan B – I created a spiced, but not spicy, chutney. If you are not a fan of persimmons, you can pair your pork with a fresh citrus gravy or a chutney of your preference. When I think of pork, I think of green beans and mashed potatoes, right away. I won’t be sharing a mashed potato recipe but I will be sharing a spicy green beans recipe. One trick that I always use to get perfect, tender and crisp green beans is as soon as I see them turn bright green during their steam, I shock them in an ice bath. The vinaigrette has hot peppers and shallots and really goes well with the sweet chutney and pork. Roasted pork tenderloin has won a spot in my weekly meal rotation. I hope you can give these easy recipes a try! 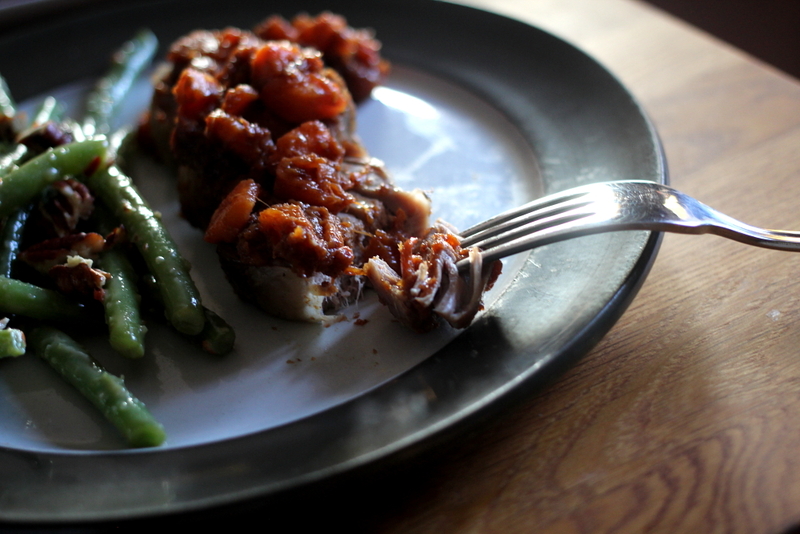 Make this easy pork tenderloin roast and top it with a seasonal persimmon spiced chutney. Leftover pork tenderloin makes for great leftovers and is a lean and healthy choice of protein. 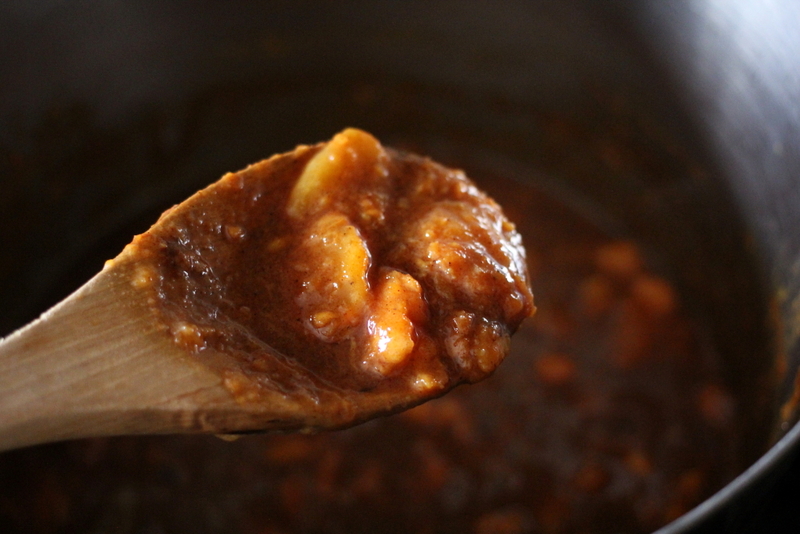 Make the Spiced Persimmon Chutney: Take two firm persimmons and set them aside. Peel and slice remaining persimmons and put them into a large saucepan. Using a potato masher, mash the fruit until it is broken down and resembles a chunky jam. Turn your burner on to low heat and bring the persimmons to a boil. Let them simmer for about 20 minutes. Stir often so the fruit does not burn. In a small bowl, combine the spices and sugar. In a separate bowl combine the vinegar, ginger and lemon zest and juice. After the persimmons have cooked for about 20 minutes, add the spices and the vinegar mixture and mix well. Keep the heat low, bring the mixture up to a boil again and let it simmer on low heat for about 1 hour, stirring often to avoid burning. 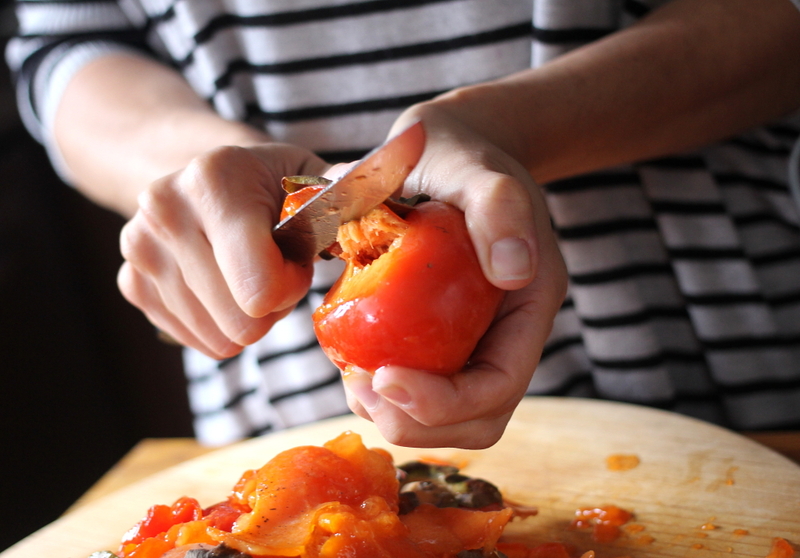 After the chutney is cooked and reduced (about 1 hour) peel and chop the remaining two persimmons and add them to the saucepan. Cook for another 10 minutes and then put the chutney into a bowl and let it cool to room temperature. 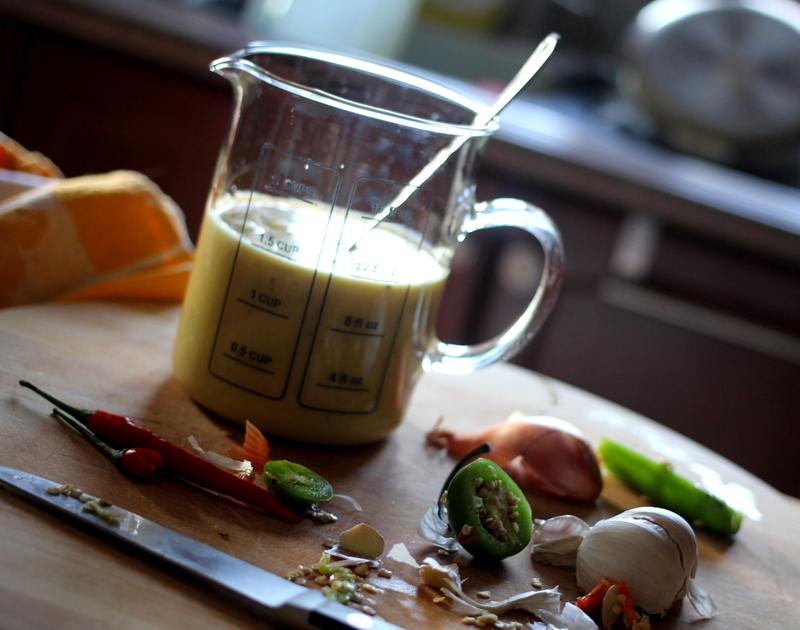 This chutney can be used with many proteins such as pork, ribs, or chicken. 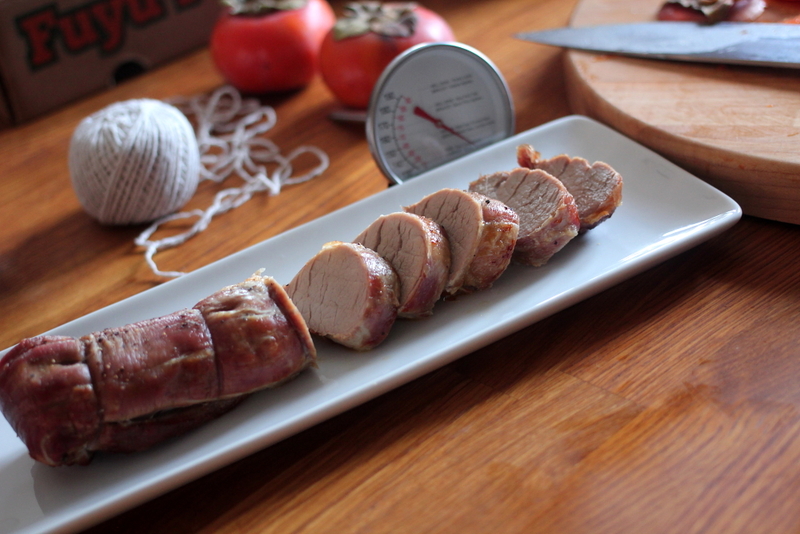 Make the Pork Tenderloin: Preheat your oven to 450 degrees Fahrenheit. Truss the pork tenderloin so that it is of equal thickness throughout. Place the pork onto a baking sheet lined with parchment paper and cover in a good amount of salt (about 1 Tbsp) and a sprinkling of ground pepper (1/4 Tbsp). Put the pork tenderloin into the oven and roast for 10 minutes. This will give the roast a good skin to help keep the juices in during the remainder of the cooking process. Turn the temperature down to 350 degrees Fahrenheit and cook for another 15 minutes, or until the internal temperature registers at 145 degrees Fahrenheit in the thickest part of the meat (about 20 to 25 minutes in total). Remove the pan with the tenderloin from the oven and using tongs, quickly but carefully place the tenderloin onto a cooling rack to rest for 10 minutes. After the roast has rested, slice the pork into 1.5 inch thick medallions using a sharp chefs knife. Serve immediately and with the persimmon chutney. Save any leftover pork and chutney in an airtight container in the refrigerator for up to 2 days. 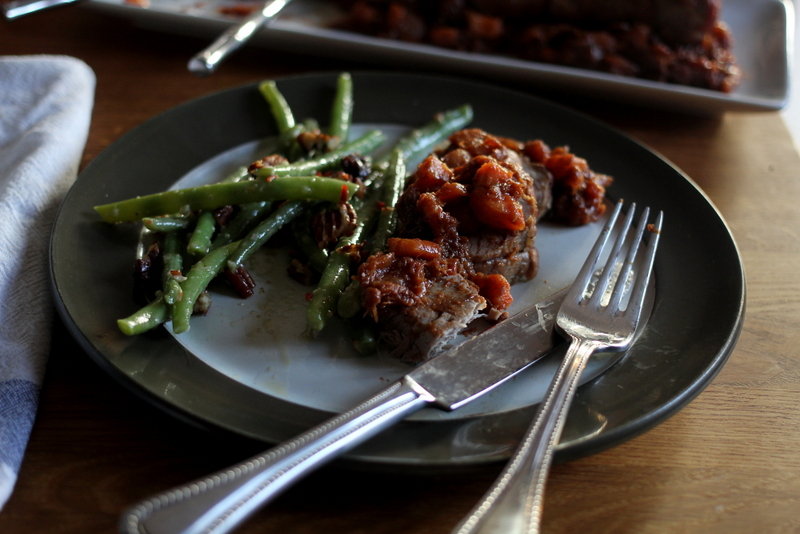 These spicy green beans make a great side dish to pork especially since they balance out the sweetness of a chutney, in this recipe. 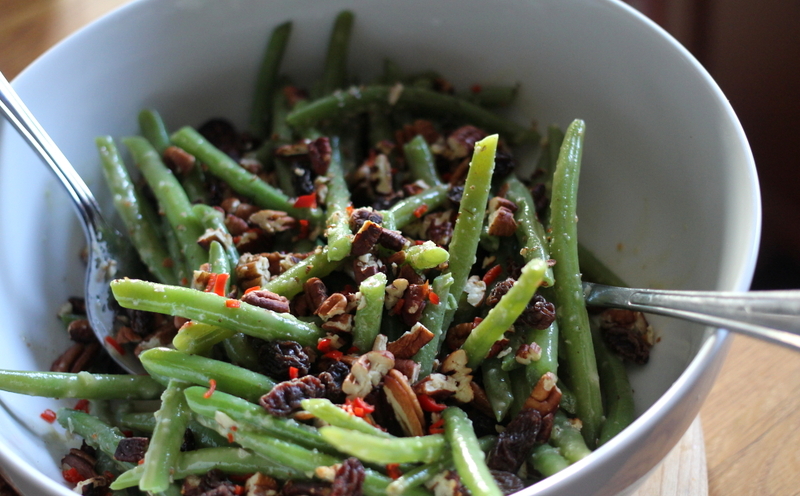 The vinaigrette is spicy and has that great hit of acidity which makes a beautiful dressing for these crisp green beans. Keep in mind the longer this vinaigrette sits, the more intense the hot peppers become, which is a great thing if you like spicy flavours. Make your Green beans: Prepare a large bowl with an ice bath. Steam your green beans until they are bright green in colour (about 5-8 minutes). Carefully remove them from the steam basket and shock them in a bowl filled with an ice bath to stop the cooking process and to keep your green beans crisp. Once the beans have cooled (about 5 minutes), drain them and add them to a serving bowl. Assemble the salad: Add your green beans to a serving bowl, add about 3-4 Tablespoons of the vinaigrette and lightly toss. Add in the raisins and pecans and give the salad one final toss. Serve immediately. The green bean salad stores well in an airtight container in the refrigerator for up to 2 days. *Disclaimer: The preceding post and recipes were created as part of a paid Partnership program with LiberTerre, however, as always, all opinions are my own.